It’s almost second nature to associate cabernet franc with France’s Loire Valley, where the grape plays a starring role among the region’s red varietals. And while many of us will forever welcome a bottle of Chinon, Bourgueil, or Saumur-Champigny — cab franc-focused appellations from the middle of that valley — it’s invigorating to go exploring beyond those bounds. A recent gathering with a Napa winemaker prompted consideration of the frequently herbaceous grape in the Golden State. For more than 25 years, winemaker John Skupny of Lang & Reed Wine Company has been a champion of cabernet franc. He and his wife, Tracey, launched their winemaking operation in the mid-’90s, intent on investigating what cabernet franc could achieve in Napa Valley soil. Their motivation was reinforced by the fact that better clones (vine cuttings with desired characteristics) were increasingly available. Still, theirs was a pioneers’ path. The couple could have focused on cabernet sauvignon, virtually synonymous with California red wine; instead, they put cabernet franc front and center, rather than relegate it to second fiddle in a Bordeaux-style blend. Northern California is not the only region where cab franc is thriving. Drive five-plus hours south from Napa to Santa Barbara, and arrive in a winegrowing subregion that inspires optimism by its very name. Happy Canyon, the warmest of the Santa Ynez appellations, is where Chris Brockway, of Broc Cellars, sources cab franc for a bottle called KouKou. The Berkeley-situated winemaker is well-known for his commitment to spontaneous fermentation, where just the microbes on the grapes transform the juice to wine. For this cab franc, Brockway sources from Crown Point Vineyard, northeast of Los Olivos, where conditions result in ripe fruit that’s fresh with acidity. Mike Roth of Lo-Fi Wines is also an adherent of the nothing-added, nothing-taken-away approach. You might recognize his name. Roth is winemaker at Coquelicot Estate Vineyard in Los Olivos. He and his friend Craig Winchester founded Lo-Fi to craft minimally processed wines for everyday drinking. The company’s entry-level cab franc, which sources grapes from two different vineyards, is a lively sipper that’s confidently structured. 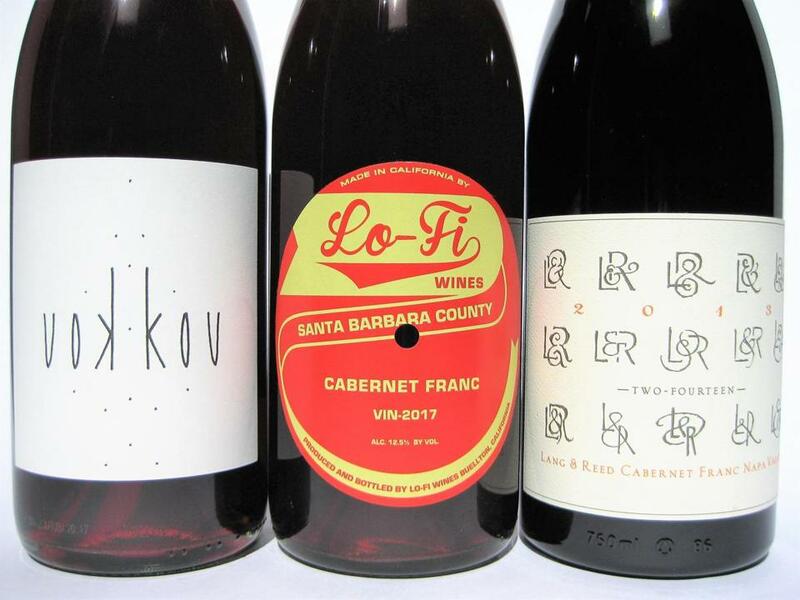 In this golden age of wine, enthusiasts can select cab franc that’s earthy, leafy, and full of Old World charm; or choose vivacious New World bottles that seem to capture the sunshine. Make room on the table for both. Broc Cellars “KouKou” Cabernet Franc 2017 A beguiling wine expressing ripe red fruit, violets, and a whiff of roasted pepper, plus a juicy, floral palate offering notes of red berries and tea. $30 to low $30s. At Pemberton Farms, Cambridge, 617-491-2244; Common Vines, Downtown Crossing, 617-800-6189. Lo-Fi Wines Cabernet Franc 2017 Grapes undergo whole cluster carbonic fermentation, a technique used in Beaujolais, so this juicy red is reminiscent of young gamay. Flavors of blueberry compote combine with appetizing vegetal notes, structure, and a hint of salt. Around $26. At Porter Square Wine & Spirits, Cambridge, 617-547-3110; Albert’s Market, Cambridge, 617-491-0288. Lang & Reed “Two-Fourteen” Cabernet Franc 2013 The vintage of this garnet-hued pour is 2013 while “Two-Fourteen” refers to the Loire-originating grape clone. Scents of crisp black cherry, white mushroom, and roasted pepper lead to a rich, lively mouthful. Around $30. At Dion’s, Waltham (Lexington Street), 781-894-1999; Dion’s, Newton, 617-964-2000.